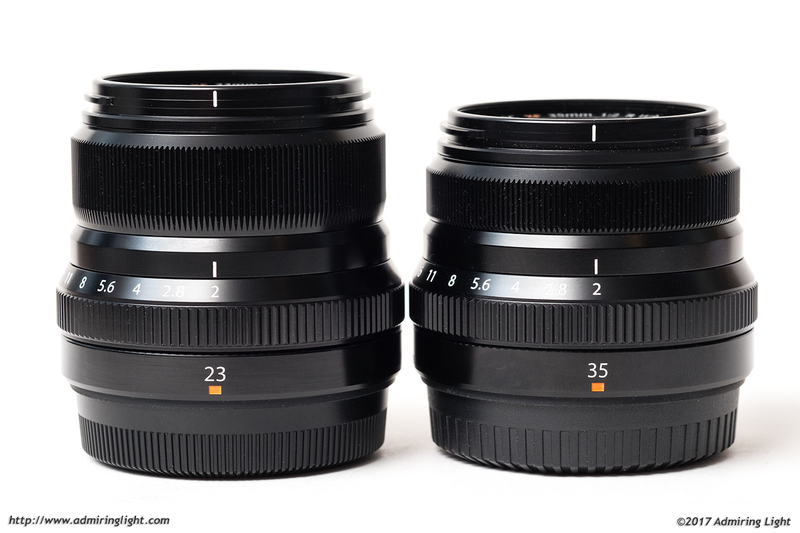 Today I’m taking a look at the second lens in Fuji’s compact f/2 prime range, the 23mm f/2 R WR. This lens joins the existing 35mm f/2 R WR, and recently announced 50mm f/2 R WR, creating a trio of small weathersealed lenses with good optical quality. The 23mm f/2 fills the classic moderate wide-angle niche, with a field of view equivalent to a 35mm lens on a full-frame camera. Since the faster 23mm f/1.4 R was released in 2013, Fuji shooters have been hoping for a slightly slower and much smaller alternative for better handling and further size reduction. It’s here now, so let’s see how it performs. 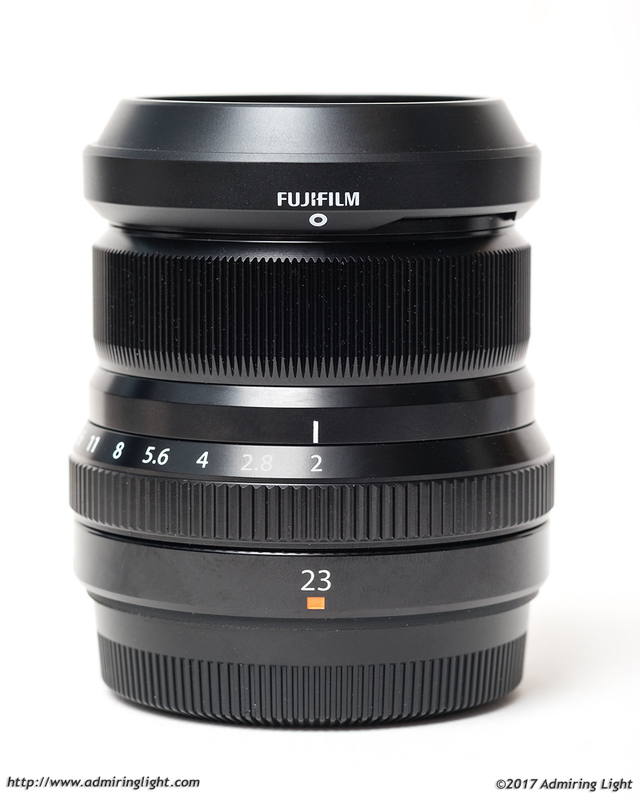 If you’ve handled the 35mm f/2 from Fuji, you’ll have a very good idea as to the construction and feel of the 23mm f/2. The lens looks almost identical to the 35mm f/2, but is slightly longer. The narrow profile and light weight means that the 23mm f/2 takes up minimal space in the camera bag and can be carried all day long without a second thought. The lens, like almost all XF lenses, has a completely metal exterior, with finely ribbed focus and aperture rings. The build quality is top-notch from an exterior perspective. The lens is very solid and there are no loose parts anywhere. The aperture ring on the 23mm f/2 has that same wonderful geared feel that the 35mm f/2 has, providing excellent tactile feedback when changing the f-stop. The focus ring is freely spinning, but well damped for accurate manual focus. Fuji abandoned the tiny screw-in hood that came with the 35mm f/2 in favor of a bayonet mounting plastic hood that provides some protection from stray light while staying very small. If you own both lenses, you’ll be pleased to know that the hood from the 23mm f/2 will fit on its 35mm brother just fine. The down side to this hood design is that the lens cap clips on the outside of it, rather than recessed into it, which makes the lens a bit longer than it needs to be when packed for storage. Still, with such a small lens, this is really nitpicking, and overall I prefer this lens hood to the one that comes with the 35mm. 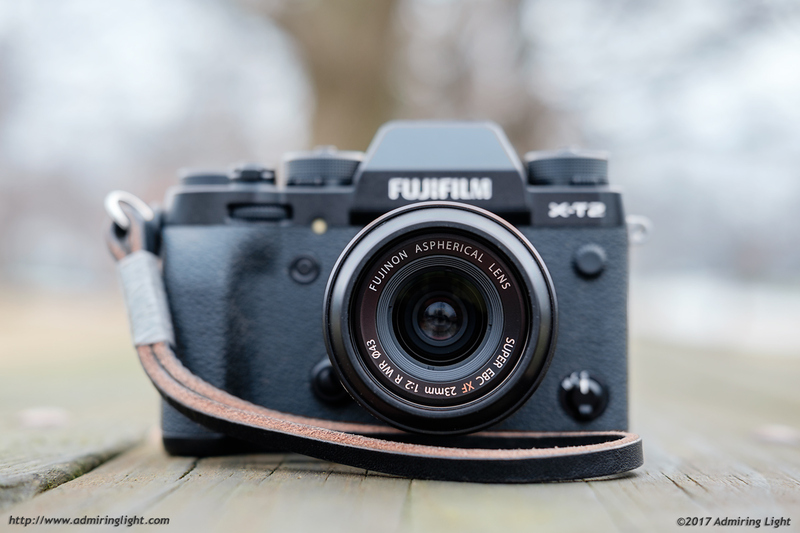 The XF 23mm f/2 does carry the ‘WR’ tag for weather resistance, indicating that the lens is sealed against intrusion of dust and moisture, and the rubber gasket that surrounds the lens mount made good contact with the Fuji X-T2 I used for testing. The 23mm f/2 is a very fast focusing lens, and the stepping motor used in the lens is effectively silent as well. As such, the lens locks focus quickly, surely and quietly, making it an excellent lens for discreet shooting. A lot of street shooters enjoy the field of view a lens such as this provides, and I’d imagine many will want to pick one of these up for the compact size, angle of view, reasonably fast aperture and speedy AF. I didn’t have any autofocus issues in my time testing the lens. Overall, the lens locked very quickly, even in lower light, and accuracy was quite good. Jordan …thank you as ever for a thorough and photographer focused review. I am a life long Pentaxian who is slowly ever slowly dipping his toes in the Fuji X world. I have the X100 ltd edition and love and hate it in equal measure. Love the look, love images when I dont miss them etc. I bought an Xpro1 with an 18 and 27 almost but really couldn’t cope with the poor focusing. Pingback: ???? ?Fujifilm Fujinon XF 23mm f / 2 R WR(admiringlight) | ??????????? that first photo os excellent. great sense of depth. You’re saying that there’s a lot of distortion in uncorrected RAW. Who is right? Thank you for an excellent practical use review. I’ve seen a bit online about the 23/2 in comparison to the 23/1.4 and the WR 35/2, both of which appear to optically superior. 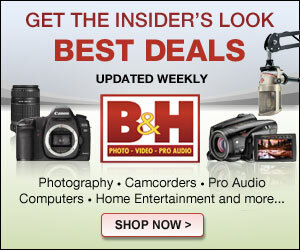 I’ve yet to see a comparison of the WR 23/2 and the 23/2 from the X100 series. I think that would be an interesting comparison. Optically, I would presume the WR 23/2 would have the edge but I’m not certain. Personally, I can’t see me having any use for the WR 23/2 since I already have the superb 23/1.4 as well as two X100 series cameras. How do you find the extreme corners? I bought this lens and returned it due to really, really bad extreme corner IQ, where it looked almost like someone smeared them. It was only at the very edges, but boy, oh boy, it was terrible. Was that just a one off, my copy, do you think? On another note, the lens is a very good Infra Red performer, in case anyone is interested in that aspect of performance. Great review -as always. Thanks. infos. ? would li?e to s?e more posts like th?s . the senior executives, that are willing to invest for both convenience and luxury. Would you be able to tell me what ISO you were generally shooting at? If you use a metadata viewer you can find this out. There’s a Chrome plugin from José Tomás Tocino that lets you right-click on an image and look at the EXIF (and other) metadata. Many of the nighttime shots looks like they’re around ISO1600 – 2000. The handheld night shots were generally ISO 2000-3200. Pingback: ??????? XF23mmF2 R WR ??????????? | ????????????? Pingback: ????? ?XF23mmF2 R WR???????????????????????????? | ???????????? ?